ENTRY WITH ONLINE TICKETS ONLY. Plan ahead: you can not buy tickets at the museum. Tickets are sold ONLY on the official website. Any other tickets to the museum you may see on sale are sold illegally (and will not be accepted). Anne Frank related (walking) tours are offered by third parties, and do not include entrance to the museum. Note: 80% of tickets for any date are released exactly two months in advance at noon (Amsterdam time) The remaining 20% become available on the official Anne Frank House website at 9:00 am local time on the day itself. The Anne Frank House, often referred to as the Anne Frank Museum, is one of Amsterdam’s most popular tourist destinations. Nowadays it is the city’s third most-visited museum — after the Rijksmuseum and the Van Gogh Museum. Our opinion: Don’t miss the Anne Frank House. It is well worth the visit. Tip: This is an emotional experience. If you visit in the morning, you may want to plan something simple and enjoyable for the afternoon — like a walk along the canals or through the Jordaan district (just across the canal). Or the other way around if your visit is scheduled for the afternoon. When do Anne Frank House tickets go on sale? The actual location of the house where the Frank family lived is Prinsengracht 263. It is part of the museum. There is a small sign on the door of the real house. It reads, in Dutch, Anne Frank Huis. Keep in mind that you cannot see the annex, which is behind the house at that address, from outside. The Anne Frank House is just north of the Westerkerk, the church whose bells Anne wrote about. It is a 12 minute walk from Dam square (green marker), or a 20 minute walk from Central Station (red marker). Regional buses 282, 284, and 288 (all operated by Connexxion; all can be boarded at Central Station) also stop at Westermarkt. All visitors must purchase an online ticket (with a time slot) in advance. Purchase a ticket online from the only legal seller — the Anne Frank Museum itself. The online ticket is valid for a specific day and time slot. Expired tickets cannot be used for another date or time slot. They are non-transferable and non-returnable. Online tickets allow entry to the museum only during the timeslot indicated. Arrive on time, as late-comers will likely not be able to enter (and the museum is under no obligation to provide refunds). What time do tickets for the Anne Frank House go on sale? It can be notoriously difficult to obtain tickets for a specific day and time. Tickets for holidays and weekends sell out quickly. Does the website state that the tickets have sold out? Unfortunately, no more tickets are available. Note that the time indications refer to the local, Amsterdam time (CET: Central European Time). The Anne Frank Museum is the only authorized ticket seller. The museum does not authorize online resellers to sell entrance tickets. Ticket scalping: The museum is under no obligation to honor tickets purchased from third parties. Last entry to the museum is 30 minutes before closing time. As you’ll notice when you are ready to purchase your tickets online, morning time slots sell out fastest, followed by early-, mid- and late afternoon entry times. People who have difficulty walking may have trouble climbing the steep staircases that are characteristic of most old Amsterdam houses. Also, the old part of the Anne Frank House, which includes the Secret Annex, is not accessible to wheelchair users. How long does a visit to the Anne Frank House last? Once you are inside, a visit to the museum takes about 60 to 80 minutes. Add extra time if you also want to visit the museum’s café and the bookstore. Frankly, we’d advice you give the café a miss, in favor of any of dozens of cafes and restaurants in the immediate neighborhood. Also, while it’s easy to be tempted into purchasing books and videos while the experience of the museum is still fresh, keep your luggage limitations in mind. and related material to your home than to lug it around. Amsterdam is a small city with a finely-mazed, efficient public transport system. So it is not necessary to look for a hotel near the museum. Then again, why not? It’s a fantastic area, right in the heart of the old city. On June 12, 1942, Anne Frank was given a diary for her 13th birthday. A little over 3 weeks later, on July 6, the family goes into hiding. Either before or after your visit to the Anne Frank House you may want to (re-)familiarize yourself with Ann’s story and that of Amsterdam during World War II. A walking tour is a great way to do so. A professional guide takes you from the city’s erstwhile Jewish Quarter to the house from which Anne and her family fled to their hiding place. The tour will allow you to see Amsterdam during WWII through the eyes of Anne Frank. This will greatly enhance your understanding of what the Frank family — and the city — went through during the war (which, for the Netherlands, ended only 73 years ago). These tours are not affiliated with the museum — and they do not include entrance to the museum. During the Second World War1 Amsterdam was occupied territory, forcing Jews like Anne Frank and her family to go into hiding. – and where the original notebook is on display – tells the history of the eight people who hid there, and of those who helped them. The Anne Frank House museum on a rare occasion: with a short queue. Note that the original house, with the Secret Annex, is behind the tree on the left. The original building — the Achterhuis (Secret Annex) has been restored and looks the way it did during the Second World War. 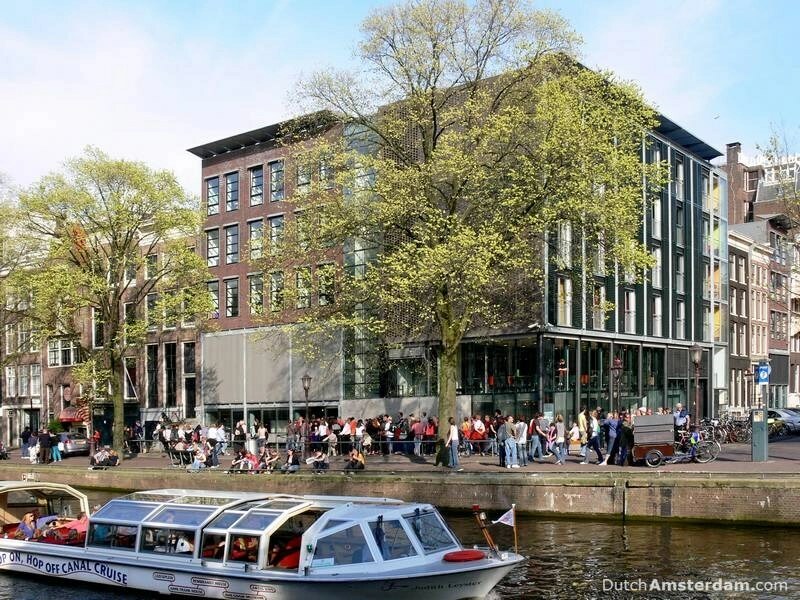 Both buildings can be visited during your tour of the Anne Frank House museum. While most people are familiar with the story of Anne Frank and its context — the horrors of the German occupation and the Holocaust — many people describe their visit to the museum as an intensely emotional experience. The museum’s collection is very sensitively done, and there are no images a child should not see. However, if you bring young children along, you may want to prepare them by providing some background information. Also be prepared to discuss the experience with them after your visit. After two years of remodeling the renewed Anne Frank House was officially opened on November 22, 2018 by His Majesty King Willem-Alexander. The museum never closed during the renovation. The Secret Annex remains the same, but everything around it has been renewed. The renovation was necessary to better tell Anne Frank’s tragic story to a new generation of visitors who may know little about the horrors of the Holocaust. Many of the museum’s visitors from abroad are younger than 25. In 2020 it will be 75 years since the end of the Second World War. There are fewer and fewer eyewitnesses, and many people are not well aware of the circumstances that drove the Franks into hiding. That makes it necessary to provide more context. The way the museum tells the Frank family’s story has been revamped. Before the renovation, visitors learned what happened in each of the rooms during the war — what the function of the room was, and who worked or hid there. But since the building is not chronological, you ended up jumping through the story. Now the museum includes a new audio tour, provided for free, in 9 languages. The audio tour does not offer object-by-object explanations. Rather, it chronologically tells the story of the fate of the Jewish Frank family and the four other people with whom they were locked up in the Secret Annex between 1942 and 1944. Fragments from Anne Frank’s diary, family stories, and historical perspectives combine to context to what you see in each room. Since visitors are now listening to their own headsets, it is quieter in the museum — which contributes to the atmosphere. “What we tried to do is … use the family history as kind of a window onto a larger history,” said Tom Brink, the museum’s head of publications and presentations. The audio tour also allowed curators to keep physical exhibits sparse. The emptiness “symbolizes the disappearance of the Jews from Amsterdam, including the Frank family,” adds managing director Garance Reus-Deelder. The audio tour includes a pointed period of silence. It comes at that part of the tour where visitors move from the light-filled front house via the bookcase into the cramped annex with its darkened windows. In our opinion this new approach makes a visit to the museum an even more impact-full experience than it already was. If you have visited the museum before, you will want to visit it again. The Anne Frank House is one of Amsterdam’s most popular tourist destinations, as is among its most visited museums. Currently it is the third most popular museum in the city, after the Van Gogh Museum and the Rijksmuseum. In 2016, the museum welcomed some 1.300.000 visitors — over 30.000 more than in 2015.3 It was the seventh year in a row that the number of visitors increased. Usually the line reached to the homomonument4 (the triangles at the Keizersgracht side of the church), and you could count on at least 1-1½ hour waiting time. If you were standing across from the house at number 6, the wait was 30-45 minutes. However, the queue often ended near the French Fries and Fish stalls — in which case a 2+ hour wait was not unusual. Until the May 2016 introduction of a new ticket and entry system a visit to the Anne Frank House meant standing in line for a l-o-n-g time. Free, Printed Tour Guide. No Guided Tours. The Anne Frank House museum does not provide guided tours. The house — with its narrow hallways and stairs, and its small roomm — makes that impossible. The 24-page guides provide background information about the different rooms in the museum. 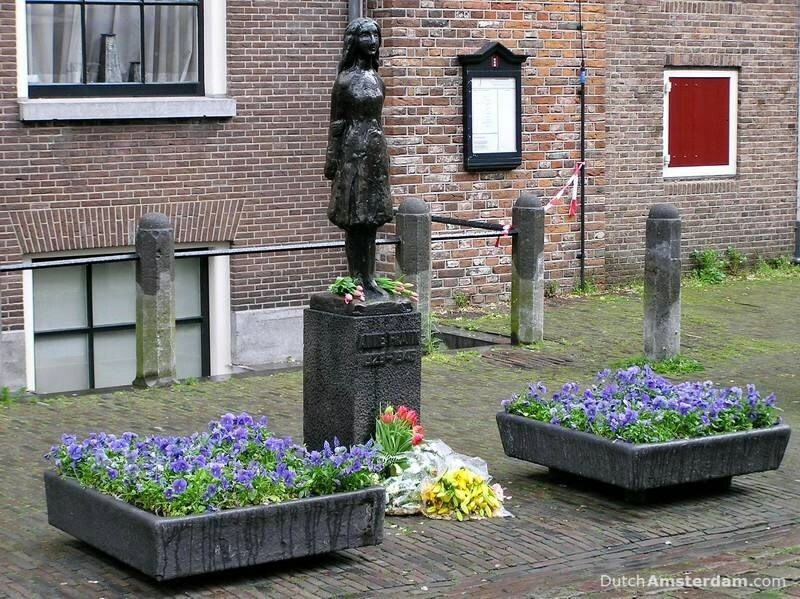 Anne Frank Monument at Westermarkt, Amsterdam. The statue was unveiled on March 14, 1977. March 14 is believed to be the day that Anne died. The Anne Frank House is located in the Western Canal Belt. Across the canal, the Prinsengracht, one can see the Jordaan – one of Holland’s most popular neighborhoods. South of the Westerkerk, across the Rozengracht thoroughfare, is the so-called ‘Nine Streets’ shopping district. As with all information in our Amsterdam Tourist Guide, this page is updated regularly as needed. The museum recently received a 910.000 euro donation from the BankGiro Loterij, a legal Dutch lottery that donates half the income of its ticket sales to cultural charities and organizations. The money will be used to adapt its exhibition. A spokesperson for the museum says little will change in the Secret Annex. But the museum plans to add more context, which will provide details about the persecution of Jews and the way Jews were excluded from daily life in Amsterdam during the occupation.